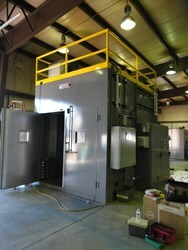 Wisconsin Oven Corporation today announced the shipment of a custom designed batch oven used for curing assorted composite materials for a prominent aerospace manufacturer. The composite curing oven features guaranteed temperature uniformity (it easily exceeded the required +/- 10 @ 500° F) with a data acquisition and control system that provides the customer with the flexibility to modify ramp and soak rates as needed to obtain the best part quality possible. This custom composite curing oven for the aerospace industry represents the highest quality designed equipment available and meets the standard of excellence our customer demands. The composite cure oven safety features include ladder and catwalks on the roof, as well as interior lighting and viewing windows. Additional features unique to composite curing include vacuum pump, vacuum stubs, thermocouple ports and jack panels.